Everybody has their own “thing.” Some of us have more than one. My “thing” is quilting by hand. I can spot a quilt one hundred miles away. 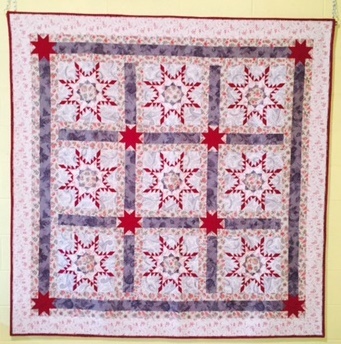 I can look at different quilts and with some degree of certainty, tell you the name of the pattern. Sitting in my leather chair with my feet up and stitching with a quilt on my lap puts me into that happy place… it relaxes me, provides a sense of calm and gives me a sense of purpose and pride. Some people have asked me why I choose to hand quilt. “Don’t you own a sewing machine? You should go buy one so that you can finish your sewing faster,” they say. OMG, no way! My goal is not to quilt fast. That is the opposite of what I want to do! I choose to go slow. I will not put my foot on the accelerator to finish a project quickly. I want slow. The world is too fast already. My husband has several “Things.” He is a 5th generation Woodworker, preparing to retire soon. While it is his job, it is so much more than that. He takes great pride in building every piece of furniture JUST SO… doing it in the traditional way of his ancestors, who started the family business back in England eons ago. lots of electrical outlets for irons, a radio or stereo, my laptop computer, sewing machines (yes, I do own a few), etc. A design wall that I can use to pin up portions of the quilt while I am working on it. A heat source. My current basement is freezing. A wall separating my sewing area from the storage area of the basement. (My husband would say “just get the crap out of there and the problem is solved.” Ignore him. A room that is not too warm. Oh, never mind the barn. We can’t afford this thing and all the bikes that would eventually come to live with him in this barn. Yes, you read that right. So if you are thinking about buying a new home, think carefully about “Your Thing.” Make a list of what you would require so that your needs are met. Share that list with your Realtor, spouse, and family. Consider the other people in your home, and what the important “Things” in their lives are. Those matter, too. « Realtor/Quilter Caron is Back!!! Living in such a tiny space, having a place for everything and everything in it’s place makes me happy. So many of the things a housewife does get undone sooner or later … and sometimes before you are even finished doing them .. I love quilting because it STAYS done.